All codes from the Creative Coding workspace that do not have a parent code will be sorted alphabetically and inserted at the top of the Code System. This applies also to newly created codes. Subcodes will be inserted according to their hierarchical position. Any color changes to codes will be applied. Merged codes will be merged, i.e. the origin code will be deleted and its coded segments will be moved to the target code. If the deleted code contained a memo it will be converted to a free memo, that can be accessed in the „Overview of memos“. The Creative Coding map will be converted into a normal MAXMap. 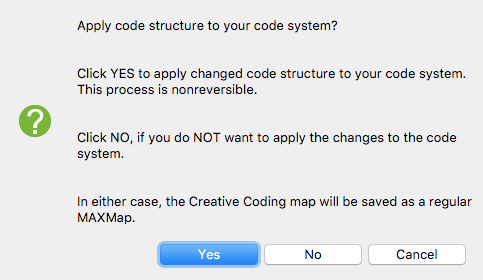 No – Creative Coding will be closed without transferring the changes to the “Code System”. This means all changes will be lost! Cancel – returns to Creative Coding.